Hurry in to Habberstad BMW of Bay Shore for exceptional offers. We proudly serve greater Bay Shore, NY a selection of new and used BMW vehicles, BMW service, parts, financing help, and more! Located in Bay Shore, we serve southern Long Island including Farmingdale, Deer Park, and West Babylon. 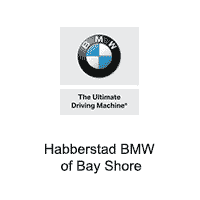 If you’re looking for a new BMW, Habberstad BMW of Bay Shore is the place to go. We have an extensive inventory of new BMW sedans, coupes, convertibles, sportscars, SAVs, and more. Looking for special features? We will help you find that perfect BMW you’ve always dreamed of. From the popular BMW 3 Series to the redesigned BMW X1 and the family-friendly BMW X5, your next BMW is waiting for you at Habberstad BMW of Bay Shore. We also have a great inventory of certified pre-owned BMW models. If you don’t want to spend the money on a new BMW, but don’t want to mess with the surprises that may come with buying used, CPO BMW is perfect. With an extensive inspection, warranty programs, and mileage caps, buying a CPO BMW is basically like buying new. We also carry plenty of used BMW models that are available for great prices. Not looking to buy? We have a great BMW leasing program as well! Talk to one of our lease specialists today so see what kind of leasing plan would be best for you. If you are looking to buy, be sure to check out our new BMW specials, CPO incentives, and even our lease offers. We want to make sure you drive home that BMW for the best possible price we can offer.